A timeless love story is finally told in Manila through Atlantis Productions’ local version of the Broadway musical Aida. 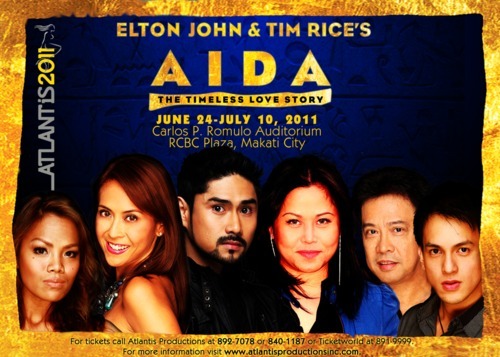 The Egyptian-inspired play with music by Elton John and lyrics by Tim Rice certainly pleased the Filipino’s craving for a good love story – the telenovela-type – where a hunky influential war captain engaged with the Pharaoh’s beautiful daughter accidentally falls in love with a slave girl, who turned out to be a princess herself. And the love triangle continued to get more complicated as the whole ensemble got involved. Manila’s own version was quite exciting because of the fresh cast. Aside from Atlantis favorite Rachel Alejandro (as Amneris) and her singer-dad Hajji (as Zoser), the lead role was given to Sabado Boys’ beatbox king Myke Salomon (as Radames). Also, this was a good ‘welcome back’ for London-based theatre actress Ima Castro (as Aida). The cast was truly pleasing to hear, with lines clearly spoken and songs flawlessly sang. For the role of Mereb, TV actor Josh Santana pulled it off although his spoken English accent has a local (Pinoy) touch compared to the rest. In some acts, one can never miss the traces of Filipino humor that made the audience giggle several times during the play. Rachel, through her excellent delivery of lines, gave pizzazz to this dramatic love story. Her antics prevented the audience from crying over very emotional scenes. Production design was creatively executed despite the small stage area of RCBC’s Carlos P. Romulo Auditorium. Here are some crazy observations courtesy of my imagination: (1) the sick Pharaoh appeared to be Professor X roaming around seated on wheelchair-type wooden throne pushed by servants; (2) Amneris’ wedding dress was quite modern, and when the veil was donned, it looked like a cake; and (3) good work on emphasizing the “Eye of Horus” symbol which was consistent throughout the 2 ½-hour play. As Aida entered its final week, its success can be justified by the room full of theatre-goers amid the rainy weather. It’s quite addictive that the songs “Every Story Is A Love Story” and “Not Me” still lingers in my mind. I’ll give 9 out of 10 stars for this third Atlantis production I watched. And there’s no other way to cap a Saturday RCBC matinee except to pig-out with a buddy in Ayala Triangle. Thumbs up for Bonchon and Banapple!